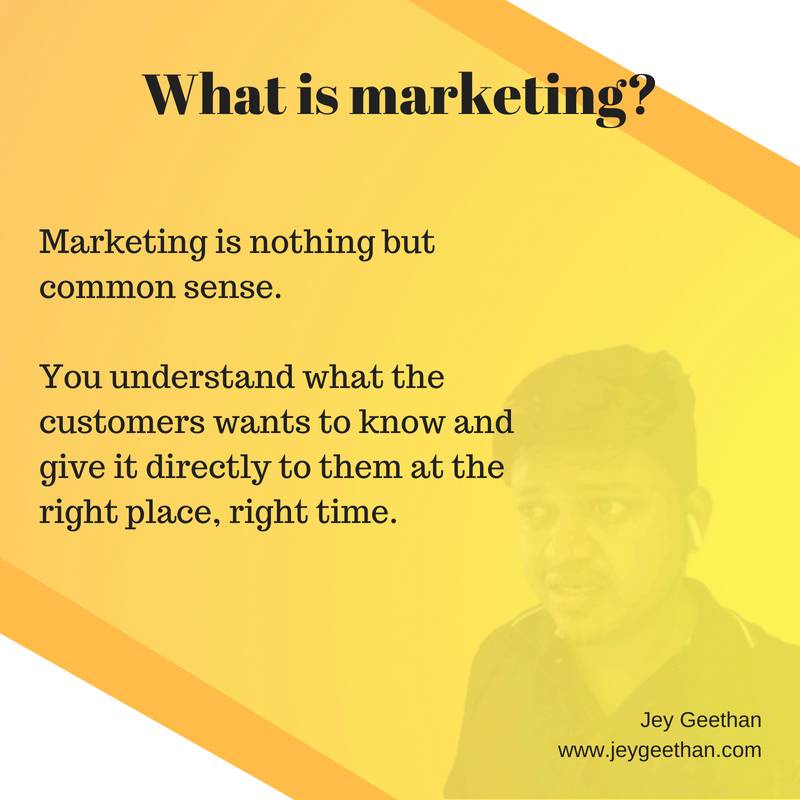 Business Blog of Jey Geethan. Here, Jey Geethan writes articles about business, work, productivity and success. In short, Jey Geethan is an author, entrepreneur, and LiveAwesomeness' founder. 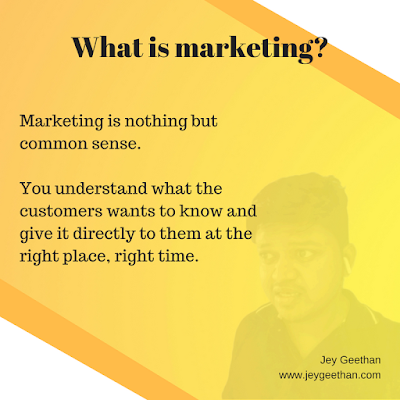 Jey Geethan's Quick Article | What is Marketing? There are umpteen number of articles about marketing and how to do it better. I am going to take a shot at quickly defining what marketing can do to your business and how it will help you increase your sales and thereby revenue. What are Jey Geethan's Quick Articles? These are short articles which are easier for the readers to read/consume. These articles will give you a short burst of information in a smaller timeframe. This is not a way to move away from long content, those are available in this website and you can subscribe to my email newsletter to receive more. Goal: Make sure that the product that you are building is catering to market. Don't build something that doesn't have a market. This is done by market research surveys etc. Goal: To make sure that the target audiences/consumers/customers are defined and their personas are ready with you. You need to know whom your end customers are going to be and define their income range, region, persona is. This can be done by field research and competitor research etc. Goal: To reach your target in the most specific and targeted way with your marketing materials. Read here about content marketing. Goal: To go beyond your usual target reach and make sure you tweak your messaging to cater to recent trends. This is done by hosting conferences etc. New trends in marketing could help you make such decisions easily. Goal: By following the above said goals, you increase the current demand for your product thereby increasing the sales and conversion. This is a very short introduction to marketing. Hope it was worth reading a few seconds of your time. Share your views on the comments below. You can follow me at Twitter, Facebook, LinkedIn and Website. Basic Support or Unnecessary Support? Back in the day, when I was running my own startup, I had this fear of missing out on important meetings and I would make sure that I block my calendars with enough of them to ensure that I was on top of everything. In my opinion, this is a basic requirement any executive would have. Comparing this to the customer mindset, there is a very simple yet important requirement that customers want to know any updates to their service or product and how it impacts them at any given moment. Customer Acquisition is Important. But Retention? I have a few tidbits about why to use microservices and why it makes sense to create few microservices as a side project and learn from the same. A lot has been said on why you should use microservices in the internet, that said, I look at it from a practical point of view and give you a very basic idea why we should use microservices and stop monoliths from becoming huge mountains of code in the future. The story begins when I encountered a HBR post that works out a few metrics about how companies that have highly engaged employees, outperform those that doesn't. My brain started thinking passively about these metrics and how it can impact business in a larger sense and I started thinking how we can have better engaged workforce that benefits both the company and the employees themselves. You will receive wonderful short stories written by him and inspirational articles once every month.